The VRBO rate calculator generates an estimate that is $35/child/night HIGHER than our actual rates. PLEASE contact us directly for an accurate quote!! Random Scoots is located in Keene, NY, in the heart of the Adirondack High Peaks region. We have offered guided hikes in the region since 2004, and are now offering two cabins for vacation rental - Random Scoots Cabin and Mercy Cabin (see VRBO listing 370114). Whether you are looking for convenient access to the multitude of activities and attractions available in the region or simply want a quiet place to relax and get away from it all, Random Scoots will serve your needs. Random Scoots Cabin (really a small home!) is over 900 square feet, including the main room (kitchen, dining nook, and living room), 3 bedrooms and 1 full bathroom. The third bedroom can alternatively be used as a large storage room set up to hold plenty of gear. The bathroom is finished with v-groove pine walls and ceiling, while the remainder of the cabin features 12' wide pine boards on both walls and ceilings, resulting in a warm and charming interior atmosphere very much in keeping with the wooded setting. Our location, 1/2 mile off Rte 73 on a private road, is accessible yet remarkably quiet. 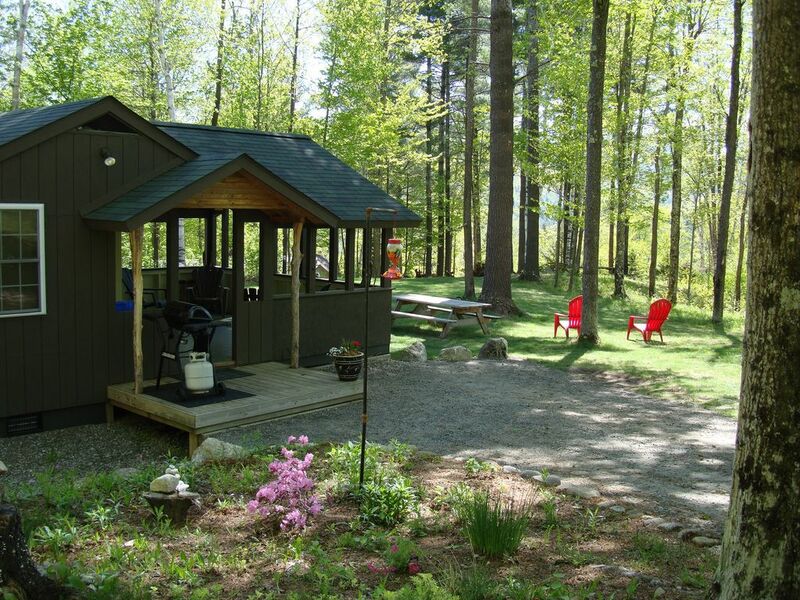 Situated on a wooded property, the grounds around the cabin transition from a well kept lawn to open woods with maintained native ground cover to a managed woodlot, resulting in an open and inviting atmosphere. The location features spectacular views across the valley to Hurricane Mountain and surrounding peaks, with glimpses of Giant and Dix Mountains. Sound effects are provided by the gentle murmur of the Ausable River East Branch in the valley below. - Whiteface Mountain: The Olympic mountain is a short 15 mile drive. It is no wonder that generations of outdoor enthusiasts have been drawn to the rugged beauty of the Adirondack Region. Visionary legislation that established the Adirondack Park in 1892 initiated a tradition of conservation aimed at ensuring that this critical natural resource be preserved. It is incumbent on today's users of the resource to carry on that tradition. We at Random Scoots believe that by responsibly enjoying our public lands today we can ensure that the same opportunities will be available for future generations. We further believe that development of the intimate and respectful relationship with nature that is so important to our future begins in childhood, and we strive to create a family friendly atmosphere, a comfortable and enjoyable retreat where parents can nurture this relationship in their children. In keeping with that goal our rate structure is designed to encourage couples and families. As a further benefit Random Scoots guide service offers reduced guiding rates to families. Additional information, including guiding rates and an online PHOTO ALBUM, is available upon inquiry. toilet, combination tub/shower, comfy soaker tub! Located above town on the morning side of the Ausable River valley, the sunrises over Hurricane Mtn are nothing short of stunning, while the gentle murmur of the river below provides soothing background music. Ceiling fans in the bedrooms and living room provide cooling comfort on warm summer days. Even so, the master bedroom features a rarely needed single room air conditioner. Gas heat in the living area plus baseboard electric in the bedrooms. Bed sheets, pillows, and pillow cases are provided. Full sized stackable washer/dryer in the cabin makes it easy and convenient to prepare for your next day's activities. Also toaster and coffeemaker/filters supplied. Open floor plan with peninsula between kitchen and living room so the chief cook and bottle washer won't feel left out! Fire ring out on 'The Point' under the towering pines provides a focal point for evening relaxation. Campfire wood provided. We had a great time at Random Scoots Cabin. It was warm and cozy in the winter. The little gas fireplace was lovely. The beds were very comfortable. It was fun to be able to have a fire outdoors in the winter. We hope to have the chance to return and enjoy it, and the wonderful hiking nearby, in a different season. Wonderful layout, cleanliness, comfort. Cozy space that is ample enough. Mountain views through the trees are inspiring. Relaxed management was appreciated also. Driveway ascent a bit of a challenge at times, but you have to pay something to be on a mountain. This is our third time staying at Random Scoots. The property is quaint and well-kept. The owners are super accommodating and make the experience all the more enjoyable. We will stay there again and recommend it to anybody else going to the area! It was our second time staying at Random Scoots and we had a wonderful time (again). It was a cold and snowy weekend but the cabin was warm and comfortable. Tom was very responsive and even helped us navigate ice on the driveway in our car. It was a great trip for the whole family. We all loved the cabin it was perfect for us. We would recommend staying here. Very nice place with well equipped kitchen. Great home base for high peaks outings. Stayed here recently for two nights with 4 adults. Cabin was clean and comfortable. Met Tom as we were departing. Very nice guy. Looking forward to booking again sometime. RATES INCLUDE TAXES!!! Instant Quotes are approximate. Please contact owner for detailed and accurate quote. Rates shown are for 1-2 Adults. * Subtract $5.00/night for each child (under 18 years of age) * Add $30.00/night for each additional adult * Add $15/night for each pet (dogs only) Rate discounted 10% for stays of 7 nights or more. Does not apply for "special" rates. $200.00 refundable damage deposit may apply.